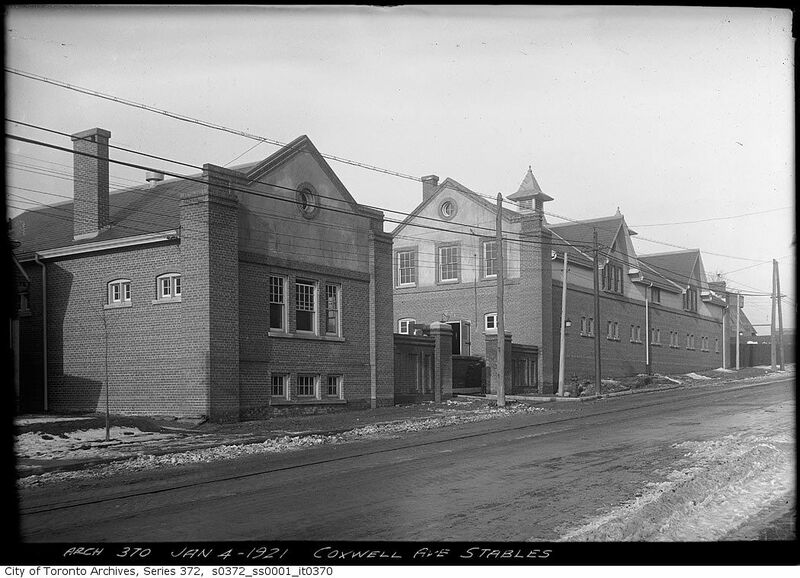 Coxwell Stables. Photo by Joanne Doucette. How to solve a little mystery? 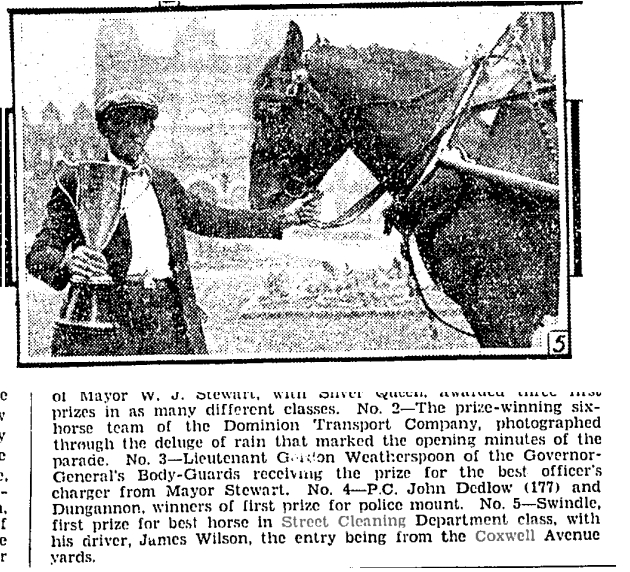 When I looked for articles about Coxwell Stables in the newspapers of 1919, I found very little which is surprising. Why? All the sources on line, including the architects who remodelled in 1985, state that it was built in 1919, but this is not actually true, I found. 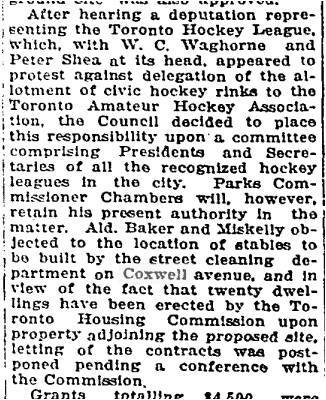 In fact strong opposition from Coxwell Avenue residents delayed its construction until 1920. 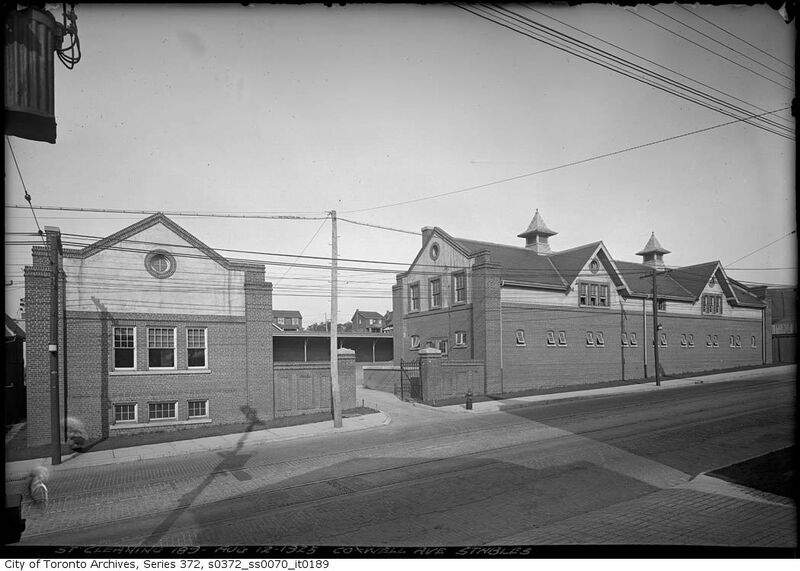 The Coxwell Stables (on Coxwell Ave. just south of the train tracks) were built in 1919 to accommodate the horses that pulled Toronto’s Public Works Department vehicles. 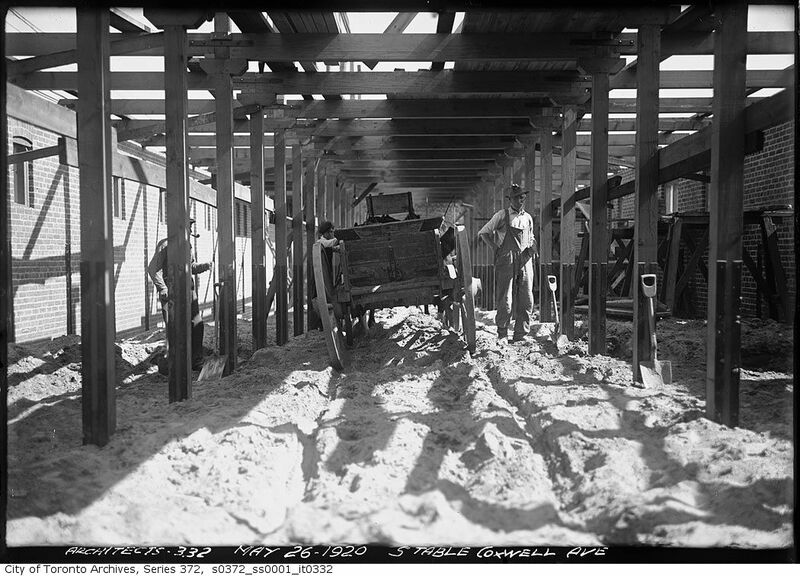 After the horse-drawn vehicles were replaced with automobiles, trucks and other machines, the stables were used mainly as a storage facility. 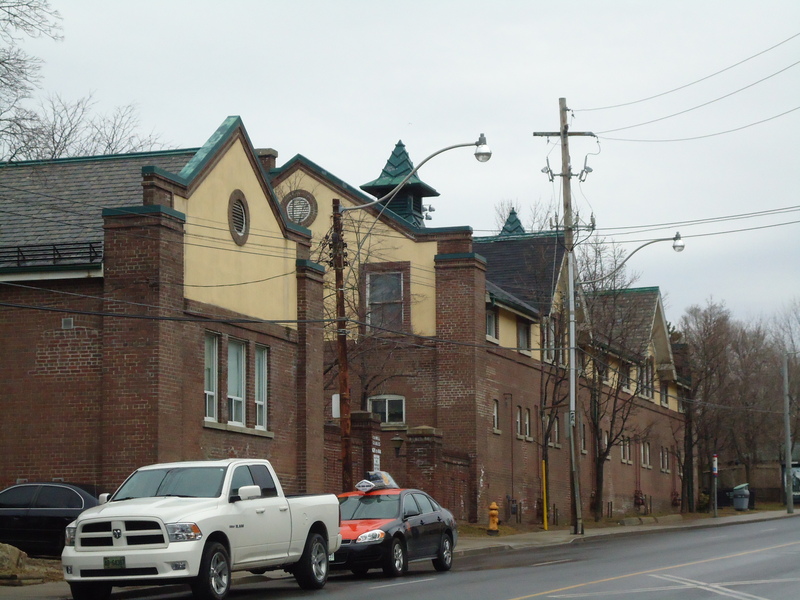 In 1981, the Toronto Historical Board designated the building a historical site and CityHome, the City of Toronto’s non-profit housing company, subsequently bought and renovated the site to offer affordable rental housing (Canada Mortgage and Housing Corporation, 2010; Toronto Community Housing, 2010). Here are some of the articles that show what really happened. 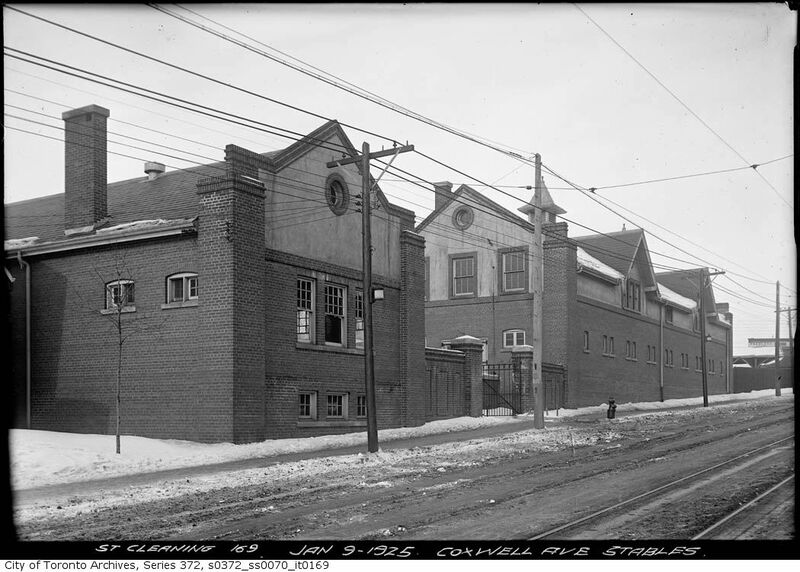 But, before that, let me note that Coxwell Stables was not the first large stable on Coxwell Avenue. 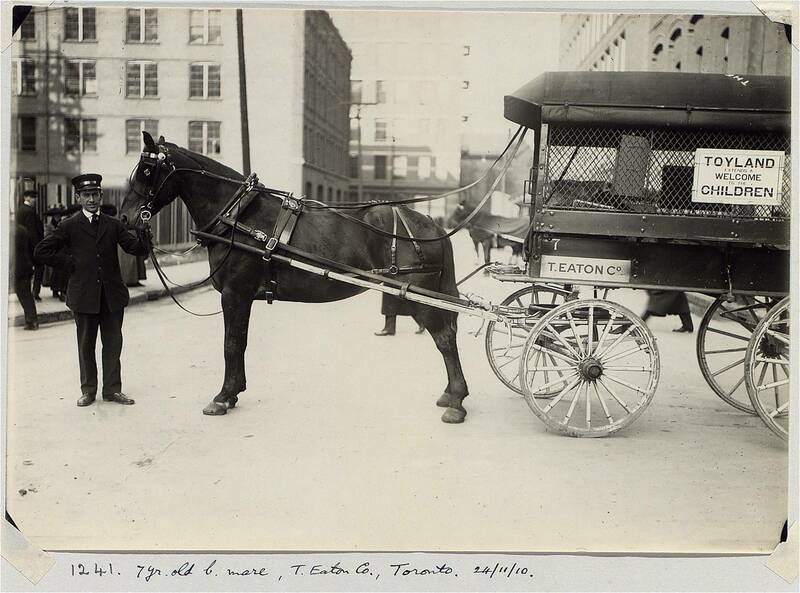 T. Eaton Co. opened a large stable on the east side of Coxwell probably begun in 1918 and finished in 1919. 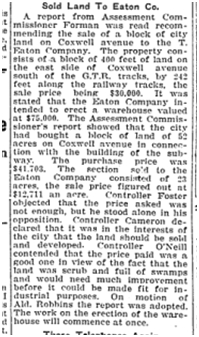 Toronto Star, Sept. 25, 1917 The City of Toronto sold land on the east side of Coxwell just south of the railway tracks to T. Eaton for $30,000. The land was described as “scrub and full of swamps”. 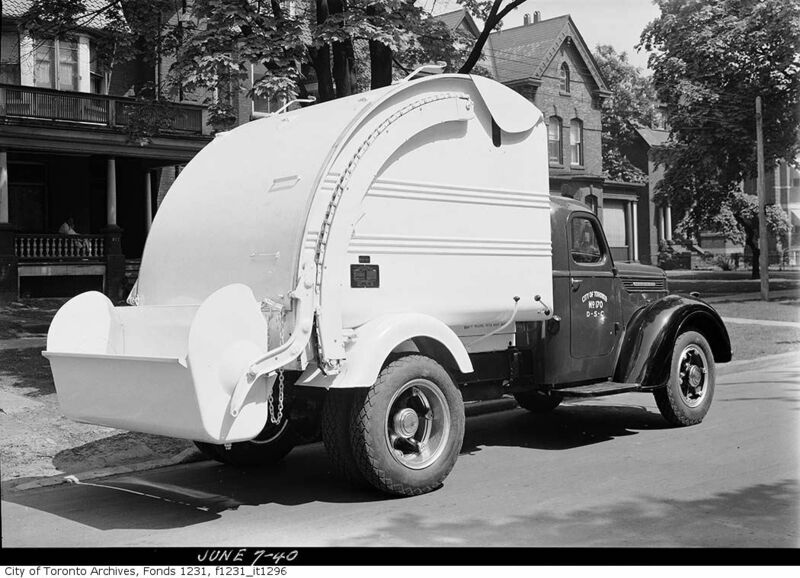 From the Toronto Public Library Digital Collection. 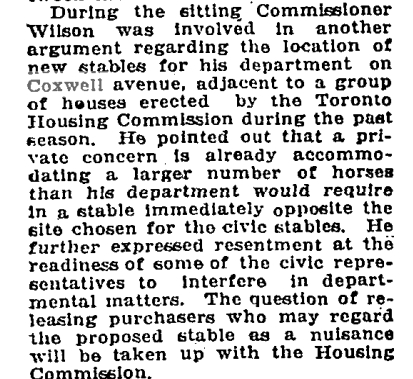 The neighbours living in the newly built Toronto Housing Company buildings on Coxwell did not appear to have objected to the T. Eaton Co. Depot with its large stable of horses. They did, however, object strenuously to another stable on the street. 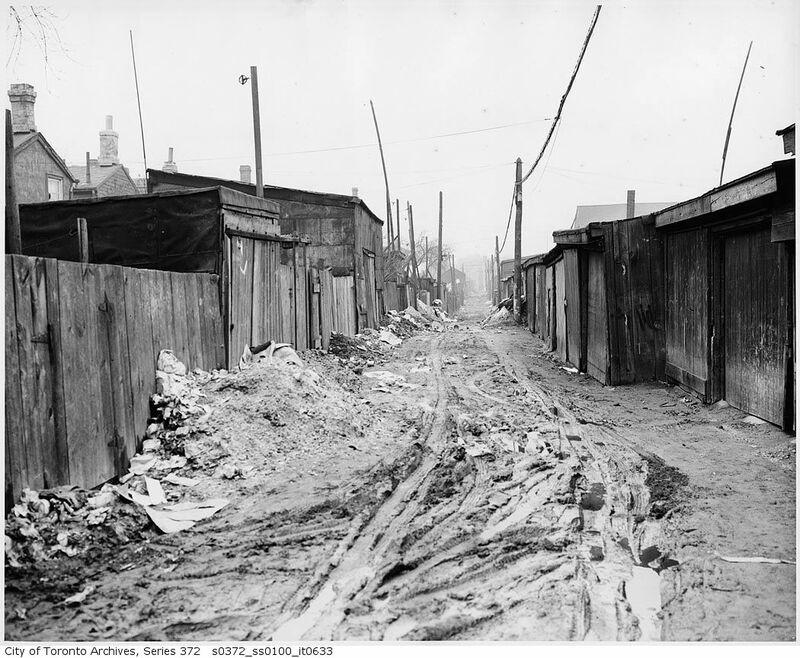 Why were stables a problem for residents? 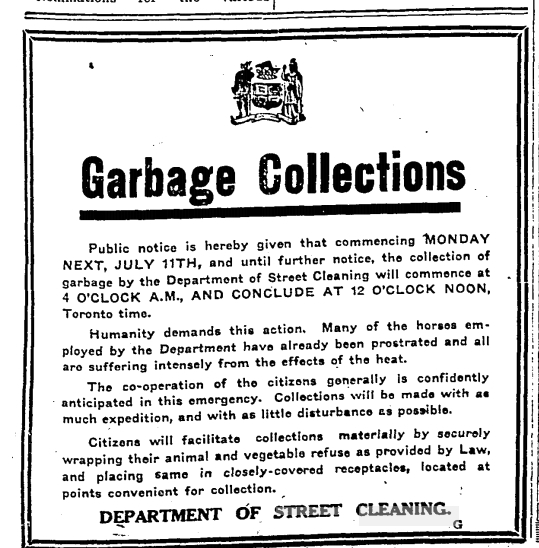 Stables meant large accumulations of horse manure and large accumulations of this meant a very large smell that would virtually saturate the air especially on hot days. As well, stables attracted flies, particularly horse flies which have a painful bite. City Council squabbled fiercely from time, at the least provocation. 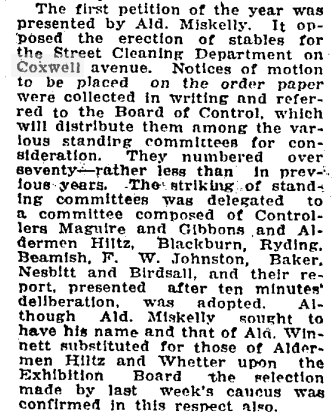 The Street Cleaning stable project provoked Ald. 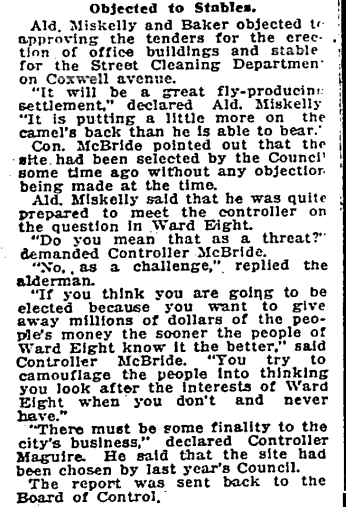 Miskelly who offered to fight Controller Sam McBride, but backed down. The site had been chosen the year before and for most of Council it was a “done deal”. 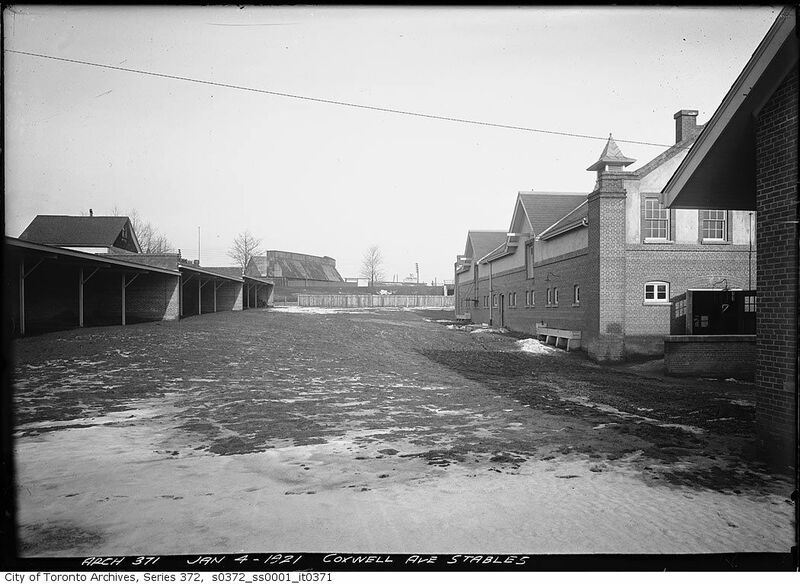 These are the new stables, ready for occupancy on January 4, 1921. 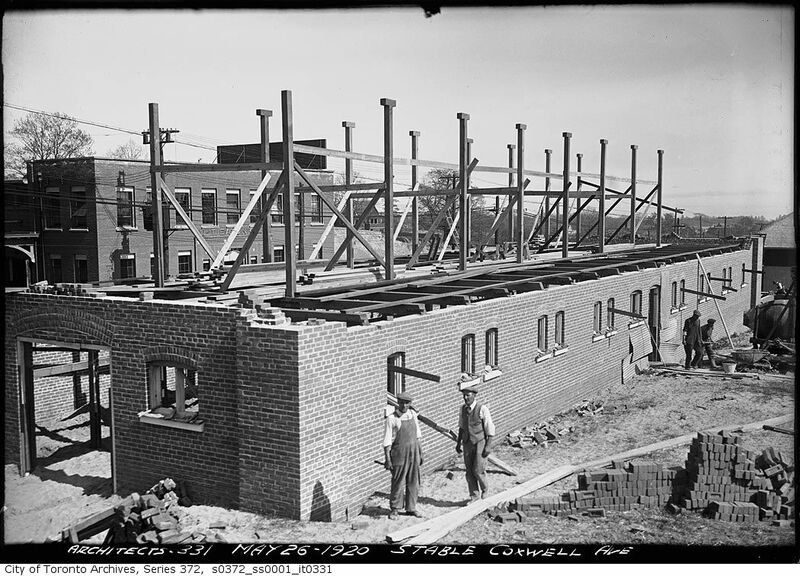 Note the small windows on the stable’s south side and on the east side of the building. These small windows were installed at the eye level of a draft horse. People who cared about their horses knew that they appreciated sunlight. Yard ready and waiting for the heavy draft horses. The Harris Coal Co. is visible on the north side of the railway tracks in the distance. Coxwell Stables wins the Cup! 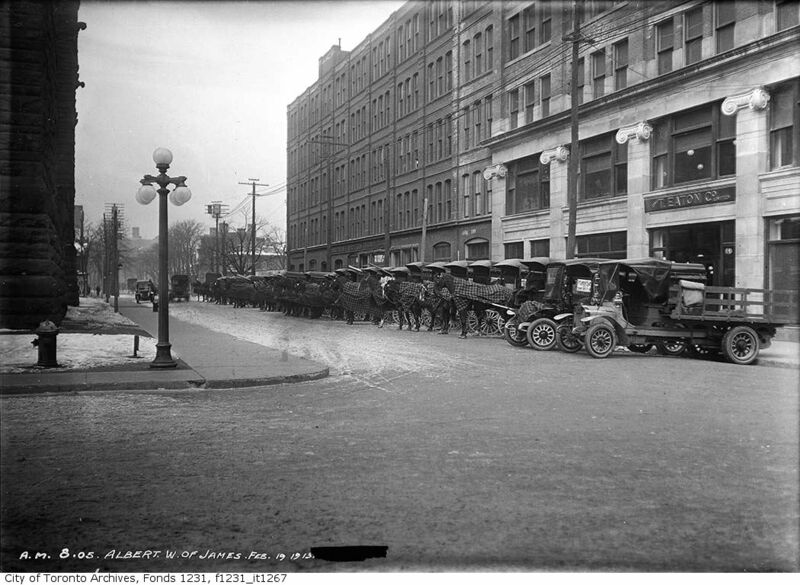 Globe, July 2, 1931, but the days of horses were numbered as the City of Toronto switched to motorized vehicles. The garbage was left out front on the sidewalk but if there was a laneway it was put it there for pick up. 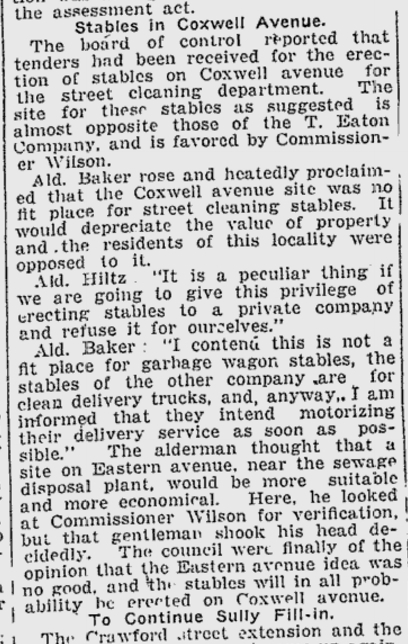 Horses had an easier time negotiating these narrow, muddy lanes than trucks, but their days on the Street Cleaning Department were numbered. 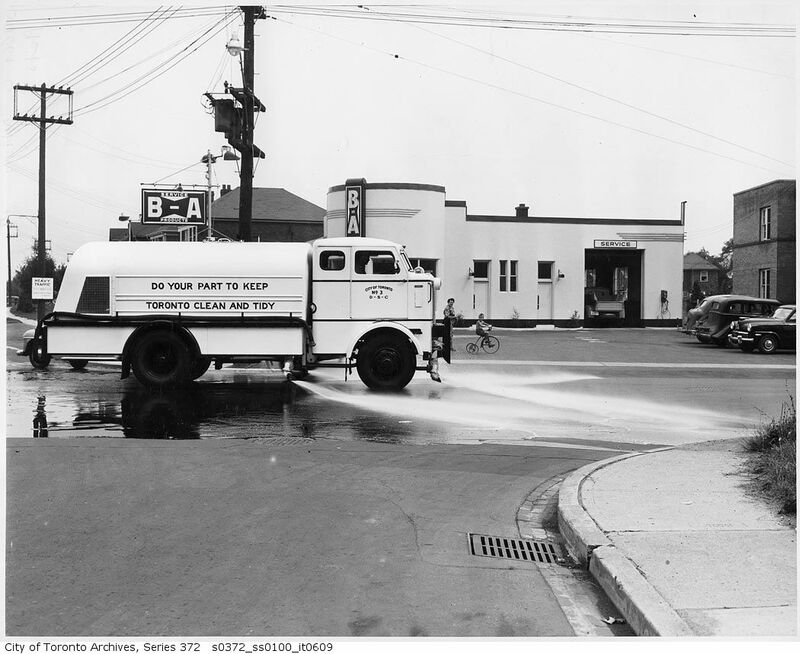 Photo from The Evening Telegram, 1940s.